Having several awards under his belt, Narate Kathong is an artist that leaves you in awe. Inspired by his childhood memories while living in a jungle, he praised the beauty of nature through his artwork collection titled "The Season of Love”. Through this exclusive collection of masterpiece artwork, he wishes to express his ultimate concern in the environmental damage to the earth as well as the nature as a result of human act,migration, world industrialization and globalization. He urges all to stop deforestation. His artworks evoke a sense of peace and tranquility. The predominant art element in his works is through the built up of thousands to millions of spots upon spots, otherwise known as Pointillism. 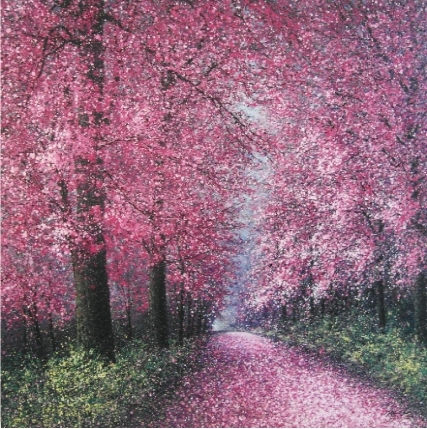 He employs the unique self-developed splashing technique of Pointillism with using brushes and hand to breathe life into the lush greeneries, natural parks and deep forest. The cheerful and vibrant colors of his paintings capture viewer’'s attention, thereby rejuvenating and delighting the viewer. His paintings create a unique platform for the viewers to immerse into the majestic composition, as though being transported to a surreal, yet nostalgic ground.